The Albany Stakes (Group 3) for fillies over 6f on good to firm ground. Twenty two-year-olds compete in this Class 1 race with win prize money of almost £40,000. This looks a strong renewal with a number of intriguing performers. 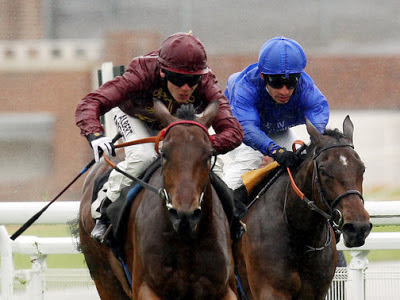 A tricky race to be dogmatic but I have one horse who could go well at fair odds - Kiyoshi. Owned by Qatar Racing Ltd, who have already tasted victory with Extortionist taking the Windsor Castle Stakes Listed race, Charlie Hills has taken his time with this daughter of Dubawi, a strapping bay filly out of a Listed-placed mare. She made her debut at Newmarket, when racing over the minimum distance, a maiden that has been franked on many occasion, including Clive Brittain's Rizeena who took the Queen Mary Stakes (Group 2) in stylish fashion. Kiyoshi quickened in the closing stages making giant strides to finish fourth. Jamie Spencer kept the ride when stepping up a furlong at Goodwood. Backed as if defeat was out of the question, she returned odds-on favourite taking the spoils by under two lengths. Many racing journalists expected a bloodless victory and in ways I thought she would have won by a good few lengths. However, the second, Ihtimal, looks a smart juvenile who suffered a narrow loss next start, and her conqueror, Wedding Ring, makes this line-up to add to the mix. Kiyoshi took time to get organised at Goodwood and that experience will be a plus in this hustle and bustle. Royal Ascot is a course which often suits strong finishers and I expect Hills juvenile to sit handy and surge to the line. It's a tough race, but I can see a bold show and at odds of 10/1 or so there is a little meat on the bone for each way backers. A fascinating race.